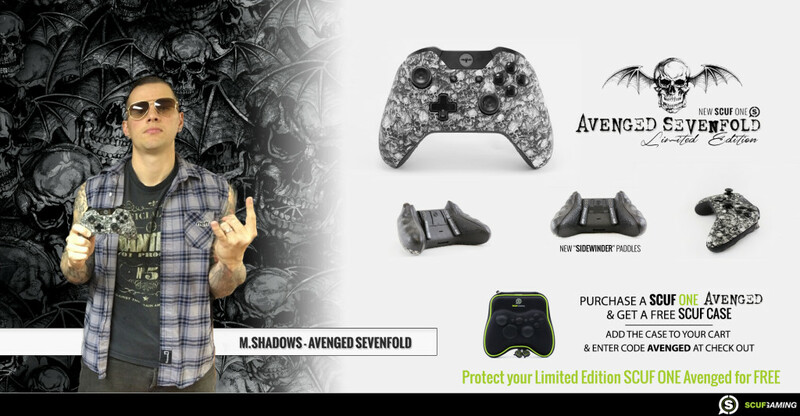 PRESS RELEASE: 24th April, 2014 – Scuf Gaming continues their partnership with famous American rock band, Avenged Sevenfold to release the LIMITED EDITION SCUF ONE Avenged controller for use on the Xbox ONE. The LIMITED EDITION SCUF ONE Avenged boasts a repeating print of the band’s logo; a skull with bat wings (Death Bat) on the guide button and LIMITED EDITION SCUF ONE Avenged Sidewinder paddles on the reverse of the controller. Only 2,000 LIMITED EDITION SCUF ONE Avenged are available! They’re hand crafted, unique and come with an authentication certificate with signatures of band members. The band’s lead vocalist, M. Shadows, is an avid Call Of Duty gamer and fell in love with SCUF controllers since using them in early 2012. In August of 2013, SCUF partnered with Avenged Sevenfold releasing the SCUF Avenged Hybrid controller, which gathered an astounding response. The LIMITED EDITION SCUF ONE Avenged combines the familiarity of the XBOX ONE controller with even more unique SCUF features. With over 4 patents granted and another 23 applied for, the LIMITED EDITION SCUF ONE Avenged optional features are rich, interchangeable and robust; from Paddle Hatch to the new concealed Internal Hair Trigger & Stop mechanism to the innovative Electro-Magnetic Remapping (EMR), every aspect of the LIMITED EDITION SCUF ONE Avenged is designed to increase hand use, improve comfort and reduce latency in an intuitive and ergonomic way. Fully customize function, feature, form and design to the gamer’s preferred style of gameplay, feel and look. The LIMITED EDITION SCUF ONE Avenged enables you to use more of your hand in a safe and ergonomic way and truly become the best gamer you can be! Over the course of the last 14 years, Avenged Sevenfold have grown to be one of the biggest names in heavy metal music. Consistently releasing ground breaking, genre defying music, the band have written and recorded some of the best and most acclaimed rock albums of the 21st Century, each different, but equally as brilliant as it’s predecessor. Their breath-taking live shows have garnered an unshakeable reputation as one of the most must-see bands in the world. Their most recent studio album, ‘Hail To The King’, was the band’s first to hit the #1 spot in the UK and their second to top the Billboard charts in the US. Over the years, Avenged Sevenfold has built a fanatical fan base that includes nearly 17 million fans on Facebook and over 1.2 million fans on Twitter. Avenged Sevenfold begins their Shepherd of Fire tour in April 2014. Scuf Gaming is the manufacturer, wholesaler, retailer, and restorer of custom video game equipment and accessories. A company focused on providing “tactical gear for elite gamers,” SCUF entered the market three years ago with the SCUF controller. Along with patented back paddles, Scuf Gaming controllers also feature adjustable hair triggers, trigger stops, military grade SCUF grip and optional domed or concave SCUF sticks. SCUF controllers are legally approved for use at most major competitions to include MLG, EGL, WGL, Gfinity, Reflex, UMG, ESL, etc. Scuf Gaming also sell a variety of accessories and apparel specifically designed for Elite Gamers.